Apologies for the delay in posting this report – I did mean to do it far sooner. Better late than never though, eh? ELISA’s Winter Warmer social 2015 took place on the evening of Monday the 9th of February. 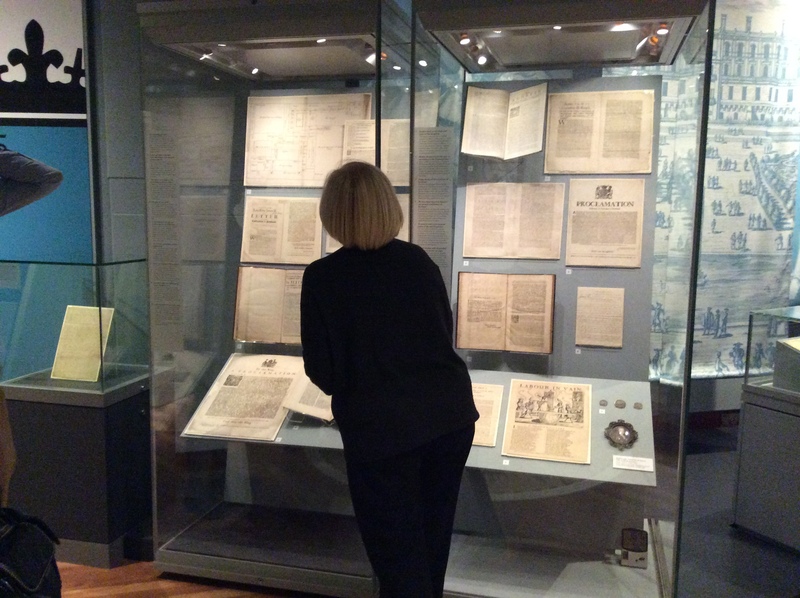 Around fifteen ELISA members turned up to the National Library of Scotland, George IV Bridge for a special tour of the Game of Crowns: the 1715 Jacobite rising exhibition, led by Rare Books Curator Robert Betteridge. I arrived at NLS a little after 5pm to find the first group had already set off on their tour round the exhibit. I chatted with those left behind and enjoyed the very tasty snacks that were on offer – many thanks to Fiona for organising those… Once Group 1 returned, me and the rest of Group 2 had our chance to view the exhibition. Robert kindly gave me permission to take photos for inclusion in this report. As you can see, the range and scope of documents Robert Betteridge has collected together is very impressive. Robert explained that he’d wanted to present the documents in context. For that reason the exhibition begins by looking at the various contenders for Scotland’s throne at the time, examining their familial connections and religious leanings. The main body of the Game of Crowns exhibition is made up of pamphlets, letters, and legislation. There are also various maps and illustrations on display, as well as coins and a very impressive sword! Touch-screens offer an interactive element, while specially recorded audio files sing songs and give voice to historic characters. There seemed to be a fairly large proportion of items on display which were written by or about the Earl of Mar, a Jacobite general. My favourite piece in the exhibit was an I.O.U, written by Mar on a scrap of paper, for items commandeered to the Jacobite cause. item 11 – the Earl of Mar’s I.O.U. It’s amazing to me that such a literal scrap of history is not only still in existence, it is here on display for my viewing pleasure! Robert Betteridge is a quietly spoken man but his knowledge of this subject is extensive. This knowledge was gained during the curation of the exhibition! I’m sure everyone who attended this event would like to thank Robert for taking the time to give us these tours. I found his commentary extremely informative and particularly appreciated the incite he gave into the creation of a major exhibition of this type. SWOP is celebrating its 25th birthday and we thought it would be fun to record what our libraries look like today – because who knows what they’ll look like in another 25 years!